Science writer Ackerman (Ah-Choo! : The Uncommon Life of Your Common Cold, 2010, etc.) looks at the new science surrounding avian intelligence. The takeaway: calling someone a birdbrain is a compliment. And in any event, as Ackerman observes early on, “intelligence is a slippery concept, even in our own species, tricky to define and tricky to measure.” Is a bird that uses a rock to break open a clamshell the mental equivalent of a tool-using primate? Perhaps that’s the wrong question, for birds are so unlike humans that “it’s difficult for us to fully appreciate their mental capabilities,” given that they’re really just small, feathered dinosaurs who inhabit a wholly different world from our once-arboreal and now terrestrial one. Crows and other corvids have gotten all the good publicity related to bird intelligence in recent years, but Ackerman, who does allow that some birds are brighter than others, points favorably to the much-despised pigeon as an animal that “can remember hundreds of different objects for long periods of time, discriminate between different painting styles, and figure out where it’s going, even when displaced from familiar territory by hundreds of miles.” Not bad for a critter best known for bespattering statues in public parks. 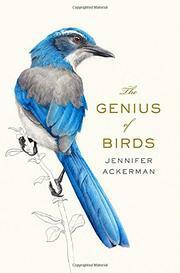 Ackerman travels far afield to places such as Barbados and New Caledonia to study such matters as memory, communication, and decision-making, the last largely based on visual cues—though, as she notes, birds also draw ably on other senses, including smell, which in turn opens up insight onto “a weird evolutionary paradox that scientists have puzzled over for more than a decade”—a matter of the geometry of, yes, the bird brain. Ackerman writes with a light but assured touch, her prose rich in fact but economical in delivering it. Fans of birds in all their diversity will want to read this one.